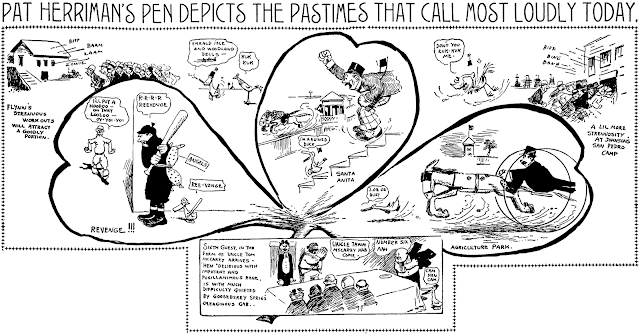 Tuesday, March 17 1908 -- It's St. Patty's Day, and Herriman's task is to highlight all the various venues that will provide sporting fans some entertainment on this unofficial holiday. The White Sox "B" Squad will again face the Angels at Chutes Park, the horseraces at Santa Anita will be running, and boxing fans can visit the training camp of either Jimmy Flynn or Battling Johnson to see what shape they're in a week before the big fight. Also on the sporting roster is harness racing at Agriculture Park. Ralph Wing Maxwell was born in Esperance, New York on February 3, 1896, according to his World War I draft card. In the 1900 U.S. Federal Census, he was the youngest of four children born to Eugene and Mary. His father was a farmer in Esperance. The family remained in Esperance in the 1910 census. Maxwell worked in a grocery store. The 1915 New York State Census said he was a college student. According to his draft card, signed May 29, 1917, he was a student at Pratt Institute and described as medium height and slender build with blue eyes and brown hair. He has not been found in the 1920 census. The 1930 census said Maxwell was 26 years old, around 1922, when he married Doris E. Drawbridge. Her book, Poems, was published by Boston publisher R.G. Badger in 1925. 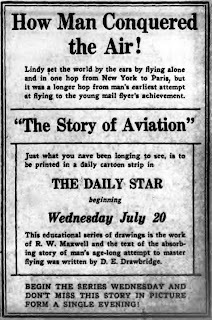 The couple produced a four-week educational comic strip, The Story of Aviation, which was published in the Queens Daily Star, (New York) in July and August 1927. They may have lived in Queens at the time. I believe both of them were employed as teachers at a public school, based on their occupations in the following census. Because of their employment, they used their first and middle name initials to disguise their identities. The 1930 census recorded the couple, both teachers, in Paterson, New Jersey at 288 Graham Avenue, their address into the mid-1940s. His name was recorded as Ray. In 1940, Maxwell was a high school teacher and his wife a grade school principal. He signed his World War II draft card on April 25, 1942, and taught at Central High School in Patterson, New Jersey. Presumably they remained in public school education in the following decades. Maxwell passed away March 9, 1984, according to the U.S. Department of Veterans Affairs Death File. His wife had passed away in November 1980. The Social Security Death Index said their last residence was Maywood, New Jersey. They must have ran them out of sequence. That might sound hard to do, with only twenty-four numbered strips, but the Star was up to the challenge. When Lucky Lindy, against all odds, touched down in France on May 21 1927, the level of public interest in aviation went soaring sky high. Newspapers cashed in on this mania through the printed word, pictures, and, of course, comics. In addition to aviation strips like Tailspin Tommy and Flying to Fame, there were more sober entries like this one, The Story of Aviation. It was obviously rushed into production by Superior Features, but nevertheless did a creditable job of telling the history of the subject and explaining a little of the science of flight as well. In the only newspaper so far found that ran this closed-end series, the Queens Daily Star, it began on July 20 1927, a Wednesday. That means the series was thought up, written, drawn, sold and in print within just two months, a pretty incredible feat, if not quite as impressive as Lindy's. 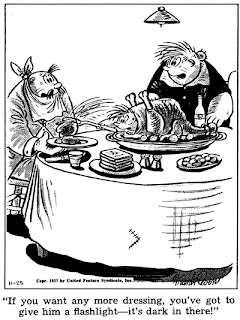 The series seems to have lasted four weeks, twenty-four daily strips. I say seems because the last strip I've seen is #23, but it looks to be wrapping up the story, and the existence of a #24 is a pretty good bet to make for an even four weeks. The art, which is serviceable, is by someone named Ralph W. Maxwell who has no other known comics credits. Though the writing is uncredited on the strip, the E&P advertisement for the strip did supply an unexpected credit, to a woman, Doris E. Drawbridge. A quick Google check reveals a possible marital connection between writer and artist -- this copy of a book of poetry for sale on eBay is signed Doris Drawbridge Maxwell. Thanks to Mark Johnson for alerting me to this feature, and supplying photocopies! 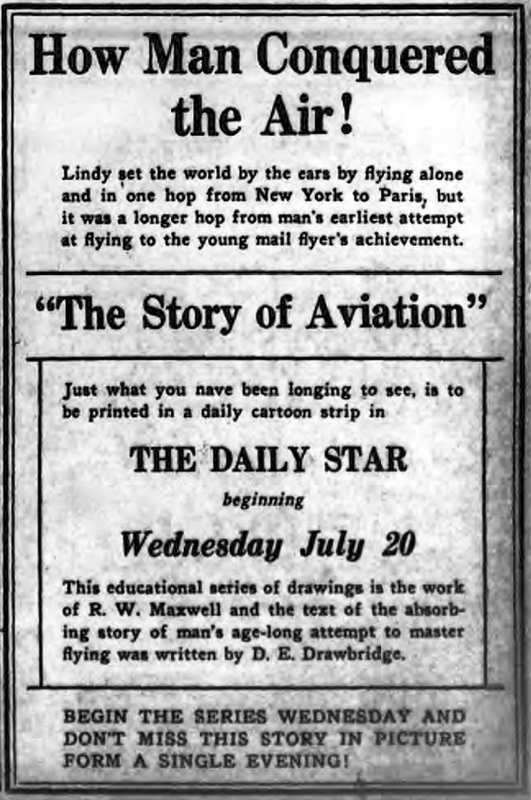 The Lindbergh strip (Tuesday, 16 August 1927) was the final episode in the series. Frank Edward Owen was born in Clarksville, Texas on February 22, 1907. His birthplace was mentioned in the Dallas Morning News (Texas), April 1, 1931, and Parade magazine, September 9, 1956. The Social Security Death Index and Find a Grave have his date of birth. In the 1910 U.S. Federal Census, he was the oldest of two sons born to Frank and Annie. (The family name was “Owens” in the census. Ancestry.com transcribed the name as “Arms”.) They lived in Clarksville. According to the 1920 census, the family was in Clarksville at 714 Comanche. Owen was the oldest of three sons. His father was a hardware salesman. Texas Painters, Sculptors & Graphic Artists (2000) said he “attended Dallas University for two years, then worked in oilfields along the Mexican border. 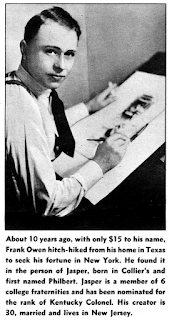 Without formal art training, he began drawing cartoons. These led to employment at a Dallas advertising agency followed by two years as a cartoonist for the Dallas Journal….” The Morning News, May 19, 1935, said “…Mr. 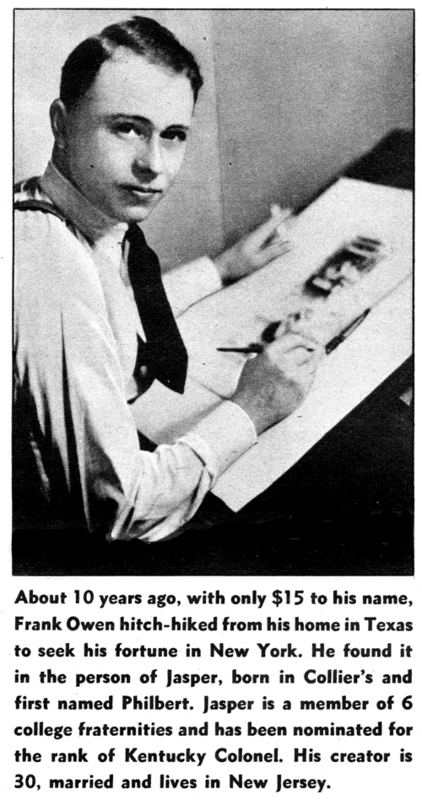 Owen got his start as an artist in Dallas, working in that capacity for the first time for the Radcliffe-Dewey Advertising Agency. 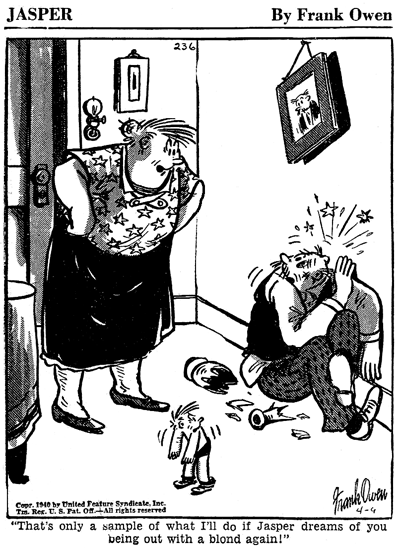 His interest in cartooning led him to newspaper work. In his two years with The Dallas Journal he passed from novitiate to clever craftsmanship….” Owen also contributed spot illustrations to the Morning News humor column, “Under Texas Skies”. He was one of at least three artists, the others were Smith and A. Streater. Unsigned illustrations began appearing on May 10, 1929. At some point they were allowed to signed their work. Owen has not been found in the 1930 census. He was one of 24 participants in the first annual commercial art exhibition which was held at the Dallas Art Institute, as reported in the Morning News, December 16, 1930. Owen’s last illustration for “Under Texas Skies” was published February 1, 1931. The Morning News, April 1, 1931, said, “Regular readers of Skies may have wondered what became of Frank Owen, former ‘Navigator,’ formerly of Clarksville, so the Sky Pilot takes pleasure in informing then that Frank is now staff artist on the Newark (New Jersey) Ledger.” After his stint at the Ledger, Texas Painters, Sculptors & Graphic Artists said, “… afterward [he] worked freelance. His cartoons appeared in Saturday Evening Post, Life, Judge, and the New York American. Owen secured a lucrative arrangement sketching two cartoons a week for Collier’s magazine exclusively….” He sold the panel Little Philbert to Collier’s magazine. (Does anyone know when the panel began?) Collier’s, January 5, 1935, featured Philbert on its New Year’s cover. 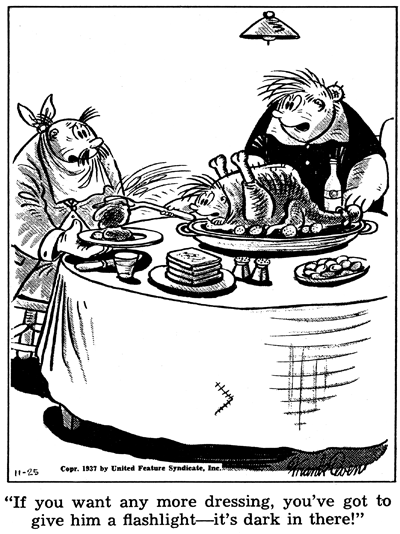 Later that year, more than 60 Philbert cartoons were published in the Philbert book. In January 1936, Owen’s strip Ossie Tittle began. It ended in in March 1937, and just a few months later, Jasper, a Philbert-like character, began in June 1937. Look magazine, April 26, 1938, published a photo of Owen (top). He has not been found in the 1940 census. During World War II, he enlisted in the navy on March 23, 1944, and was released December 8, 1945. He wrote and illustrated Morris the Midget Moose, which was published by G.P. Putnam's Sons in 1945. The character was featured in a 1950 Disney film, according to Animated Short Films: A Critical Index to Theatrical Cartoons (1998). The Morning News, December 19, 1946, noted the passing of his mother. At the time he lived in Haverstraw, New York. In 1947, his illustrations appeared in Ogden Nash’s Musical Zoo, published by Little Brown and Company. Owen passed away February 24, 1971, in New Jersey, according to Find a Grave. After the short run of Ossie Tittle, which we covered yesterday, Frank Owen wasn't soured on newspaper features. In fact, he made the smart move to introduce a feature with a built-in audience. 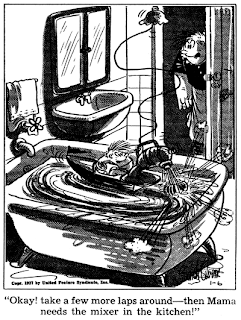 Owen's first big splash was a cartoon called Philbert, which regularly appeared in Collier's magazine, one of the top gag cartoon markets. It was a huge feather in young Owen's cap. So when Ossie Tittle died in infancy, he decided to do a newspaper series starring his Philbert character. 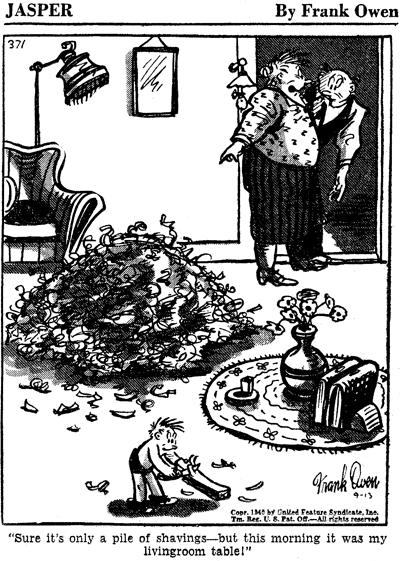 For reasons I don't know, he changed the name from Philbert to Jasper, and the daily-only panel cartoon had a modestly long run, from June 7 1937 to August 7 1943, distributed by United Feature Syndicate. Owen had a really dumb sense of humor, many times boiling down to meaningless non sequiturs. Who are these people? Parents of a Tom Thumb-like tiny mutant? Jasper is a tiny neck-less, shoulder-less hunchback who can't talk and who seems to have the power to make his parents/owners do the most pointless, bizarre things, like build their own battleship, fly a giant kite, or dress in a suit of armor. I guess you better just call the panel screwball, because if you try to make sense of it you will get a headache, just as it evidently did Cole. If you just accept that Jasper is some sort of quasi-uber-tot with powers far beyond those of mortal men, the panel is sometimes chuckle-worthy. Cole and me, though, we're headed off to the medicine cabinet for some Tylenol. Thanks to Cole Johnson for some of the samples, and the prose! With all the interest in so-called 'screwball' strips, I was surprised to find hardly a word being mentioned in the standard references, nor around the whole darn interwebs, about Frank Owen or his strip Ossie Tittle. While I would not call it a great strip, it certainly was about as screwy as they come. About the only thing I could find was a very short piece on the Comics Journal's site by the usually anything-but-terse Donald Phelps. Owen's drawing style recalls Milt Gross, and his gags are, if anything, crazier than most of the stuff Gross came up with. Owen is well into Bill Holman no-holds-barred asylum-bound wackiness. If there was any underlying plot-like structure to the strip it is lost on me, though Phelps seems to have managed to uncover some method to the madness. All I can say is that we have Ossie himself, a big stupid lug, and a lot of second-banana big stupid lugs (both male and female varieties), some even stupider lugs that make cameo appearances, and the occasional child who is smarter than the balance of the cast put together. Ossie Tittle ran from January 6 1936 to March 6 1937, distributed by Consolidated News Features, one of the several NANA syndicates. It was a daily and Sunday effort, with the Sunday being accompanied by the topper strip Bumpy Bear. The Sunday may well have had an even shorter run than the daily; I have only seen examples from June to September 1936. 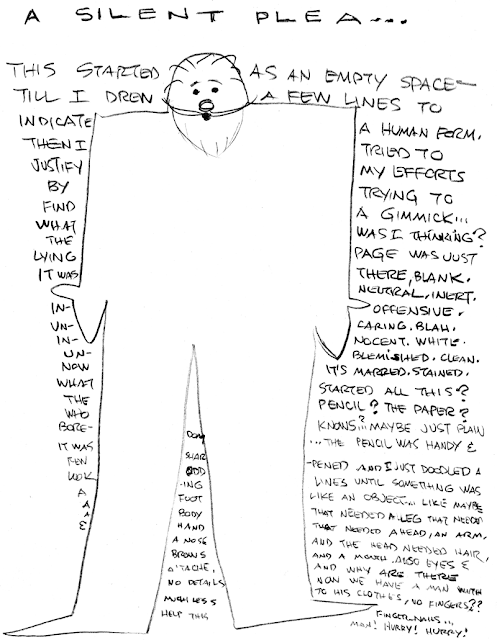 Whether the strip did badly, or Owen felt under-appreciated is unknown, but the strip was discontinued in favor of another feature, which we will get into tomorrow. I love the lettering style.